The Hajj is one of the five pillars of Islam and is obligatory to be performed once in the lifetime of an adult Muslim as long as they are physically and financially capable. 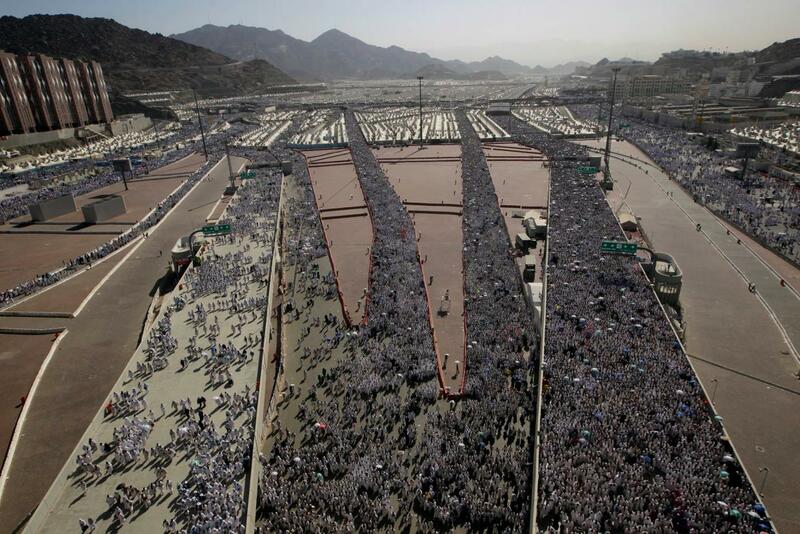 In reality only a fraction of the world’s Muslims can participate in this holy pilgrimage to Allah’s house in Makkah. Those who are incredibly blessed to actually perform it can only do so if God sends you the personal invite. There are not many things in life that one does only once in a lifetime as a matter of choice. We had been meaning to perform Hajj for many years, but for one reason or another it did not happen till this year. The invite takes many forms including easing of financial responsibilities of taking care of kids educations, seeing that the parents have been adequately take care off etc.. Performing Hajj is an extreme form of worship. It has at least four different dimensions. The most obvious one is logistical in nature. Different rituals need to be performed at specific locations and at specific times. Some of the rituals predate the current form of Islam. There are actually three different types of Hajj. We performed Hajj-e-Tamattu, or the leisurely Hajj. 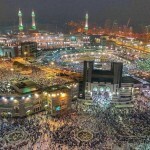 This form of Hajj can be performed over three months period. In the old times Hajjis used to perform business during Hajj and this form of Hajj allowed for doing it. The second dimension is religious. For this one needs to learn Hajj specific prayers for the different rituals. The hajjis utter Talbiyah during the course of Hajj. 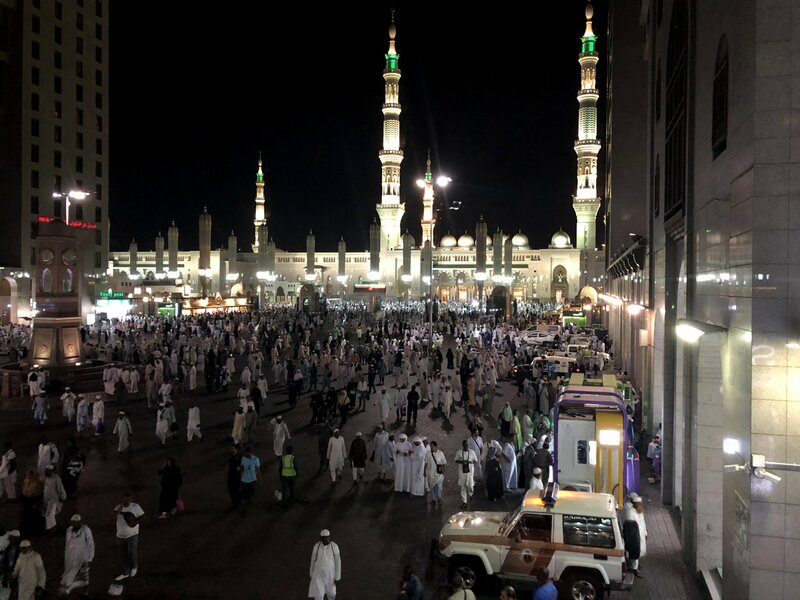 There are specific prayers during Tawaaf ( the seven circumambulations around Kaaba), during the seven trips of Sa’i and during the stay at Arafat. The third dimension is spiritual in nature. This starts many months prior to the actual journey in the form of developing an awareness of self that is removed from space and time. Generally the Hajj is performed when most of the worldly obligations have been taken care of. This release from the here and now and life’s experiences allows the Hajji to reflect in her relationship with Allah. The fourth dimension is transformational in a sea of combined humanity. 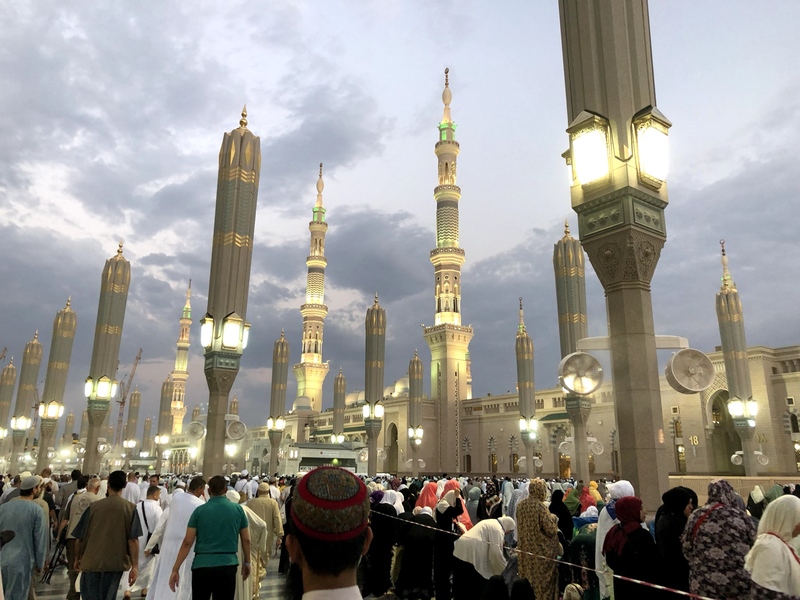 This is manifested in experiencing one million hajjis walking calmly to pray at Masjid e Nabwi in Medina five time a day, in a million circumambulating Kaaba, in millions walking towards Jumaraat and spending the day at Arafat. Experiencing humanity up close at this scale day in and day out provides a unique perspective. Each country represented by their people had a distinct behavior pattern. There is an emergent human experience that only occurs in a shared experience at certain scales of size and diversity. 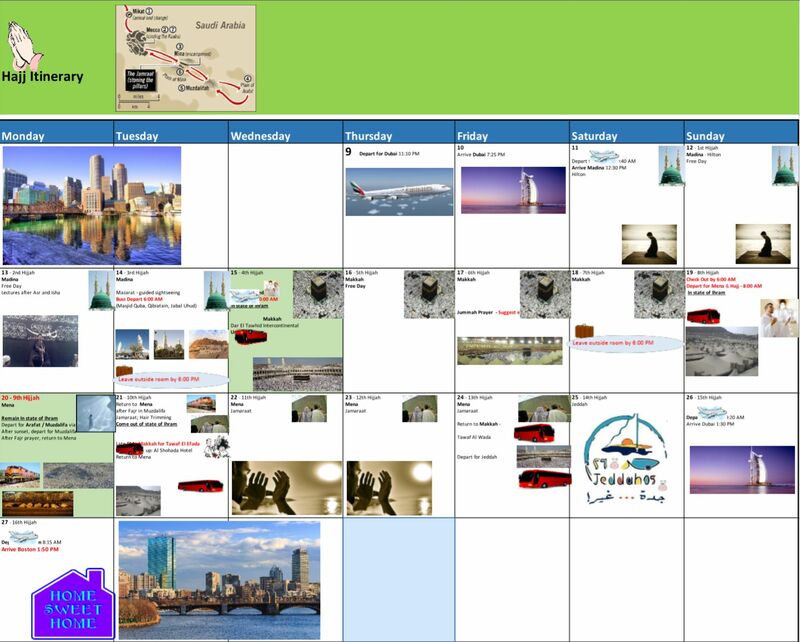 Our Hajj started on Aug 9th with flight from Boston to Dubai on Emirates Airlines. 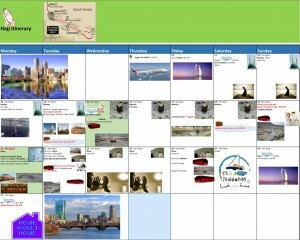 This was a new offering by Dar El Salaam Travels (DST) whose 4C package is what we had taken. In the prior years the main option had been to fly Saudia out of New York. After an overnight stay in Dubai we arrived in Medina on Aug 11th.. What looked like a swamp just short of the runway on the forward facing camera turned out to be lava fields. Having volcanoes so close to Medina was quite a surprise. As it turns out the region is volcanically quite active. Reached Medina after staying a night in Dubai. Took us a long time getting through immigration as Saudi immigration officials were getting us used to developing patience. Met first time with the DST folks who aggregated all the hajjis coming from all the different countries. It was a little unnerving giving the passport to DST manager for safekeeping for the duration of the stay. 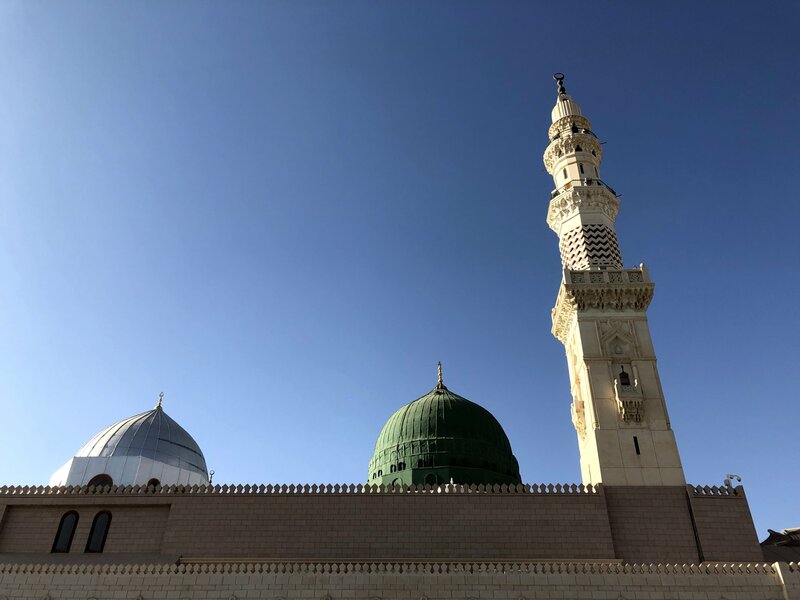 Medina Munawara ( the radiant city) is where Prophet Mohammad PBUH spent his later years and where Islam came to be established. 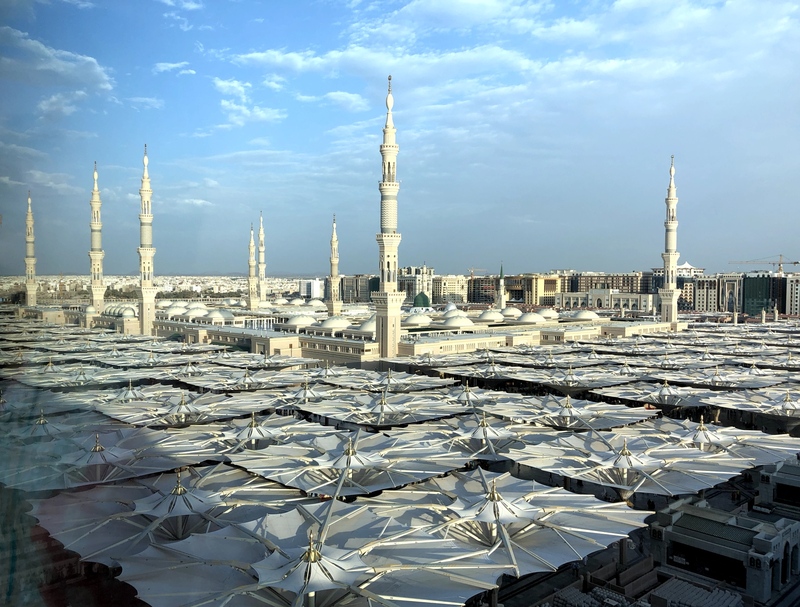 The Prophet’s Mosque or Masjid an- Nabawi is at its center. The extent of the current mosque was the entire extent of the city during Prophet’s time. During Hajj period the mosque can accommodate up to over one million people. The soft dome features are accentuated with Turkish style minarets. The surrounding area is dotted with an array of 250 umbrellas that provide protection from the sun. The sandy color with oriental motifs make the umbrellas visually soothing. The Prophet’s burial place or roudah is contained in a separate building that was the original mosque. The area in front of the roudah is considered heavens on earth. 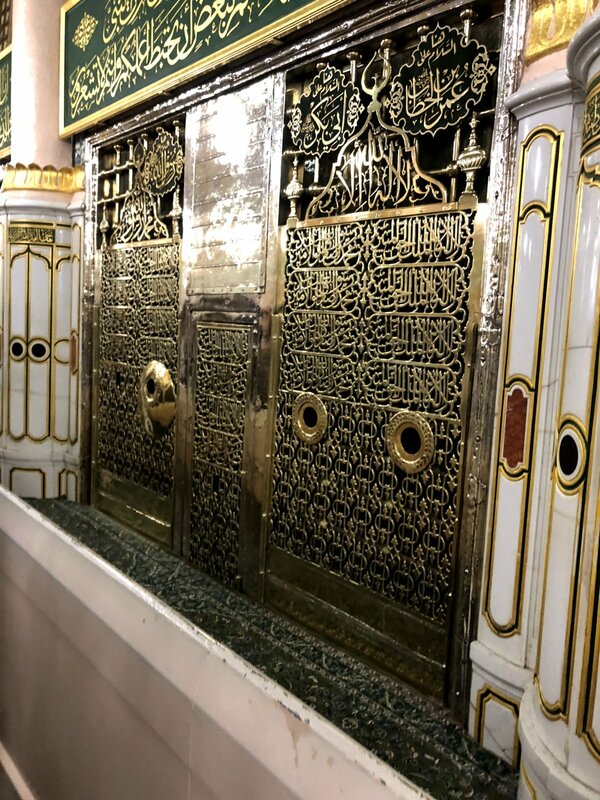 Praying tahajjud and fajr prayers and reading the Holy Quran sitting in front of the roudah was one of the most spiritually up lifting experiences of Hajj. We stayed in the Medina Hilton which is situated right in front of the main gate of Masjid. The service and food at the hotel was the best that we had while in either Medina, Makkah or Jeddah. We took a taxi ride to Jang e Khandaq area and saw the remnants of the trenches still visible. Seeing Masjid Qiblatain attests to the Jewish origins of Islam. Muslims in this mosque prayed initially facing Jerusalem. During one of the prayers the message came that the qibla has been changed and the imam started praying towards Makkah from then onward. DST took us to the scene of Jang e Uhud where the hill on which the archers were stationed is one of the unspoiled areas of the early Muslim history. Standing on the hill provides a person the grand view of the scene of the battle. In this battle the muslims were defeated and Prophet PBUH was injured. Many of his companions were shaheed primarily due to not following Prophet’s instruction. This was an abject lesson for all muslims, even though the Prophet forgave them. I think this was one of the lowest points among the Muslims during their stay in Medina. Experiencing the scenes of the different battles provides us with the tenuous nature of the struggles of the nascent religion. During this trip we also visited Masjid Quba. This is considered one of the first mosques built in the world and Prophet used to pray in it every Saturday. 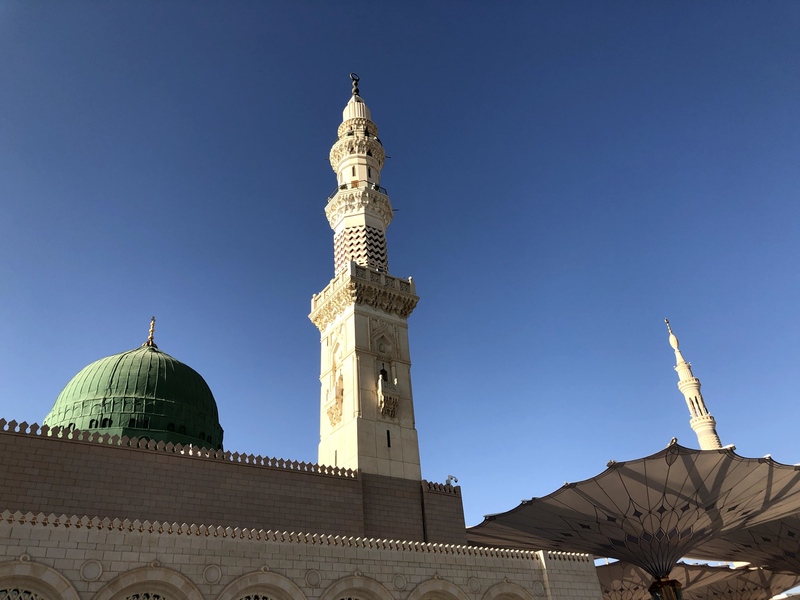 He advised others to do the same, saying, “Whoever makes ablutions at home and then goes and prays in the Mosque of Quba, he will have a reward like that of an ‘Umrah’. The area around the masjid al Nabawi is going through continuous reconstruction and expansion. All the hotels surrounding the masjid have been leased for twenty years. All of them will be relocated further in increments of twenty years. So the courtyard that we saw will be totally different in the years to come. 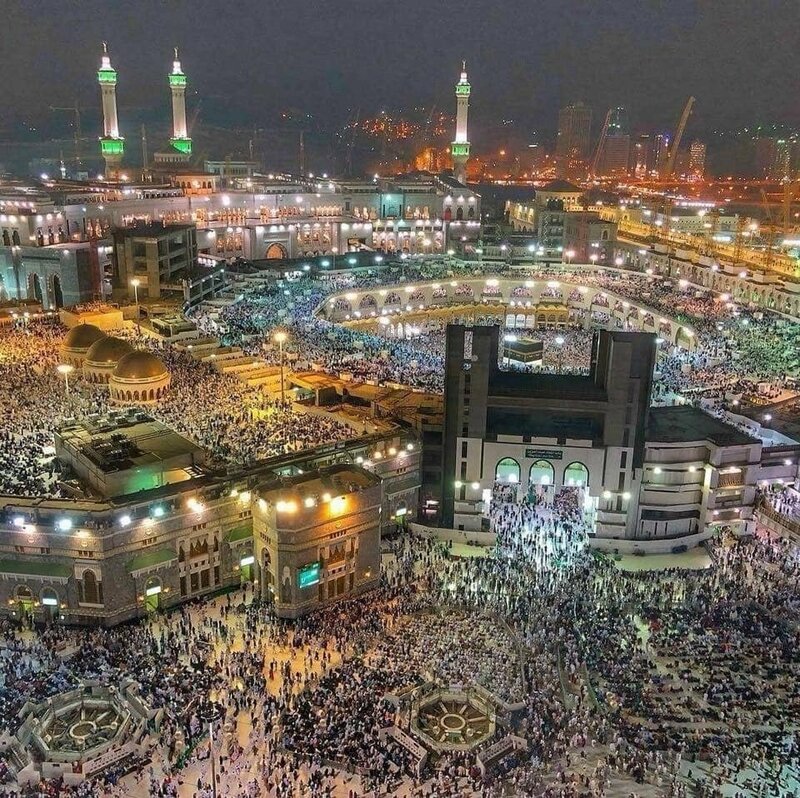 Makkah. Wed August 15th. -August 18th. Today we depart for Makkah and umrah. Put on the ahraam for the first time. The sheikh had explained to us the night before as to how to do it correctly. I had bought a belt a day earlier and that turned out to be very handy. We boarded a Saudia chartered Boeing 747SP for Makkah. 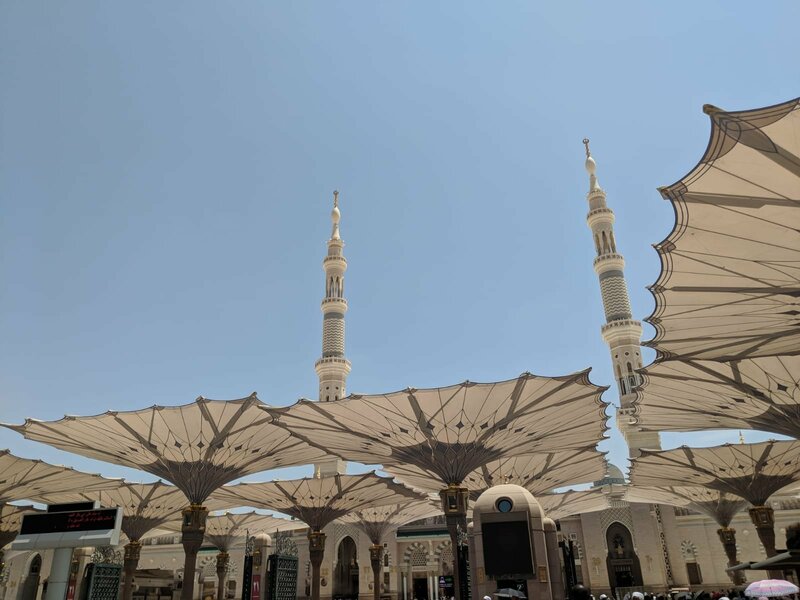 The miqat is very close to Medina so the intention for umrah was made immediately after take off. The US counselor was there to receive us when we reached Jeddah which was a nice touch. The bus ride to Makkah took us less than two hours which was considerably less than the six hours that we had been told. We performed umrah immediately upon reaching Makkah. The crowds were surprisingly sparse and the temperature was quite bearable. Performed tawaaf on the ground floor. After the third tawaaf got separated from the sheikh and the group. Did rest of the tawaaf and Sai by ourselves. Exiting sai at Marwah was confusing. Ended up having to travel sai worth of distance back to the hotel. It was great to see our bags in front of our hotel room ( hats off to DST). We stayed at Dar Al Tawhid Intercontinental hotel that is right in front of the King Aziz main gate to the haram. The view out of the room looked right into the haram. The Azan and prayer was piped into the speaker of the room. There was a nice large praying room on the third floor overlooking the haram where we ended up praying most of the prayers. As it turns out the whole of Makkah is part of haram. We prayed tahajjud on the roof of haram. Sheikh Kifah gave us a sermon after it talking about not being too specific on what we ask God. Checked out shops in the tower mall. When the prayer time came we just formed for prayer next to a shop. Other people just joined us. All the shops close during prayers and the imam’s voice can be heard through speakers. The food at the hotel was extensive in its selection. Too bad I could not touch most of it due to contamination concerns. There were lectures every night that educated us about the coming days. We came out of ihraam after the first umrah but performed tawaaf during other days in normal clothes. On the third day in Makkah we left for Mina by bus. We took only limited luggage. Most of our baggage was handed over to dust for shipment to Jeddah after hajj. This is where the real hajj begins. Even though we had one of the best locations on the camp at its entrance and next to jumaraat, the space was very limited. Our tent was right next to the main road into Mina and next to the emergency response and fire station. With no sound insulation it was a minor miracle that we could sleep at all. We we were about 50 people in a tent. In the case of women they were nearly 80 in a tent. The sofa seat extended to become as bed with some limited storage space above. This was something like being in a space station with gravity. We lived here for the next five days. The air conditioning oscillated between hot and cold, mostly being too cold. Luckily my neighbors were very interesting company and when we were not praying or listening to a sermon, we got an opportunity to have many engaging discussions. The time from Asr to Mughrib is considered the time for repentance and prayers. Hajjis address God directly and He is most receptive to the prayers. We left Arafat for Muzdalifah where Hajjis spend the night under the sky. DST again had done a great job of having cushioned beds and pillows available along with the signature dishes. This again is something that I think DST should let the experience be raw, as most others are under going. We left Muzdalifah after midnight as the old and physically unfit are allowed. But it seems that most Saudi Hajjis also decided to do that. In the logjam the Saudi authorities treated non Saudis as second class. Giving Saudis the first class treatment. This was also evident in many other places. Such non Islamic behavior is one of the most glaring Saudi flaw in understanding of the basic tenants of Islam. It took us nearly three hours to travel three miles or so once we finally reached the train. At Muzdalifah we are supposed to gather stones for stoning the Satan on Jumaraat. This part of hajj is the most tricky for me to understand and pre-dates Islam. On the way in from Muzadalifah we stone one of the largest jumaraats. After the sacrifice of the animal and trimming or shaving of the head the Hajjis take off the ihraam. This is now the day of the Eid. Tawaaf el Effada needs to be performed that includes the Sai. We did that at night when the crowds were sparse. Most of the time was taken up in traveling from Mina to Makkah by bus. We had to walk through the tunnel, as buses are not allowed to enter Mina. This day was he most eventful and intense. The remaining three days at Mina are essentially those of slowly winding down. Each day started with the stoning of the three Jumaraats. Rest of the day was spent praying, listening to lecture and mostly talking and socializing with other Hajjis. One of the most uplifting experience was walking against the traffic through the different groups of hajjis going to the Jamaraats. Some of the groups were chanting prayers. Others just walked quietly. They wore the clothes of their countries and some had identifications of the organizing entities. 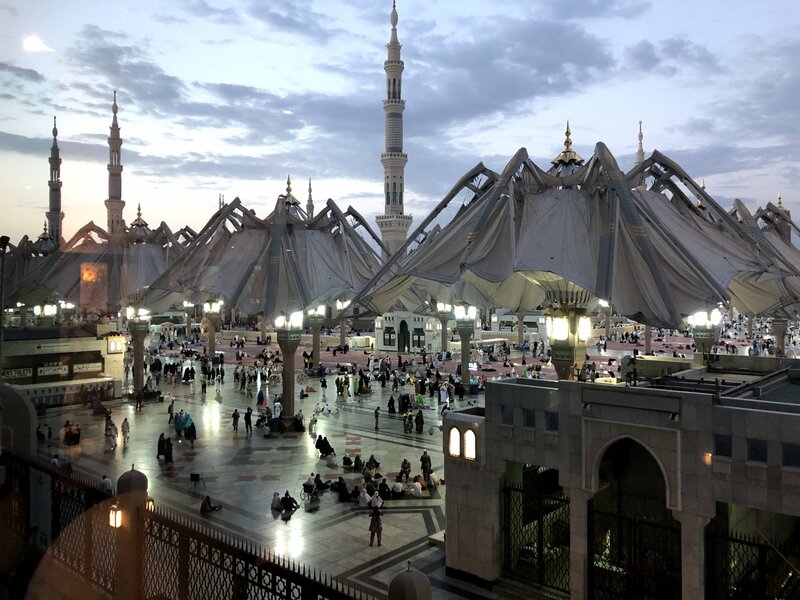 If you believe that we are spiritual beings having a human experience, than it could explain the difference in experience our spirit mingles with those close by and that is as diverse and large as the people in Mina. There were a lot of African countries represented there. I was most impressed by the demeanor of African women. They came from lower economic strata but carried themselves with tremendous grace. Their faces were content even when sitting under the hot sun waiting for the next prayer in Haram. Jeddah August 25th – August 26th. On the last day after Mina we performed Tawaf e widdah. Sai is not performed then and Hajjis are meant to leave Makkah. This was the only time that there was rush in Kaaba and we started the tawaaf on the roof. But then the sun came up and we moved to the second level that had fans and was cooler. We left for Jeddah immediately after the tawaaf. We pent two night in Jeddah where we visited the floating mosque. Also checked out the Red Sea Mall which was full of western stores. Bought thobe ( Saudi men dress) and dates. Our departure from Jeddah airport from the hajj terminal was event-less and quick. A perfect hajj is the one that God accepts. Perfect here has been used from the point of logistics and ease. We were understandably apprehensive doing hajj at the peak of hot season in a dessert. We had also heard of delays at different stages from those who had gone before. We were lucky not to experience any delays or hardships. 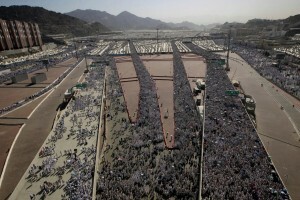 Hajj is a quintessential Abraham inspired ritual and is a shared celebration of humanity as one. There used to be time that it took many months to perform Hajj and many hajjis used to die in the process due to illness and old age. Air travel and investments in infrastructure and hotels has made it relatively easier. It is something that should be performed when a person is physically fit, as it is physically demanding. Even though only Muslims are allowed to perform it, I wish that people of other faiths could also experience it and see humanity and its interaction with the Creator in a scale and splendor that cannot be otherwise experienced. Imran, this is an impressive presentation done with a professional’s skill. Very competently edited and compiled. Of course, I shall refrain from commenting on some of the claims and assertions theirin, but as for the write up itself, it’s very well done. I have enjoyed the read, particular the first person narrative, irrespective of my theosophic divergence. Kudos for that.